To make this scarf, you don’t need to know how to knit or how to crochet! Yes, that' right! 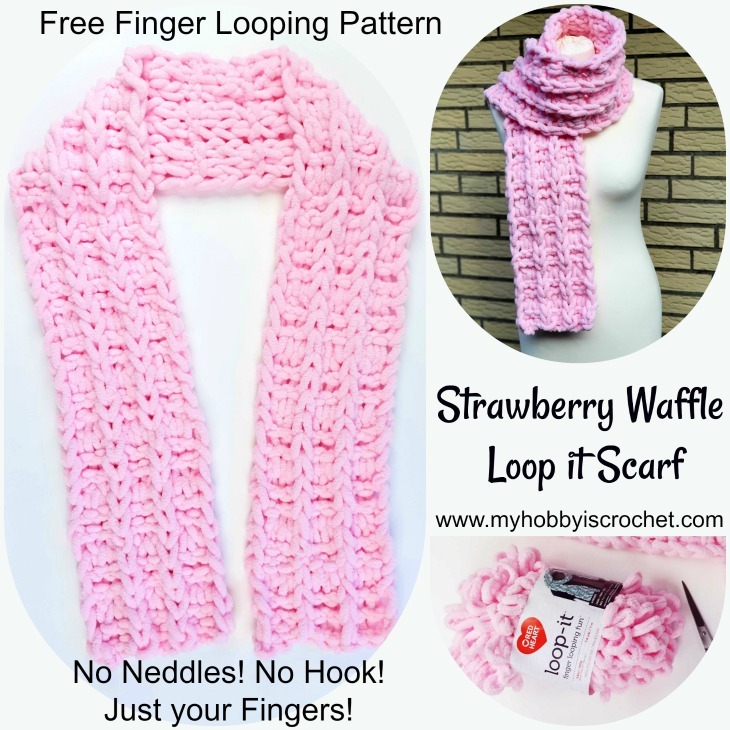 Because the Strawberry Waffle Loop It Scarf it's made without any needles or crochet hook! 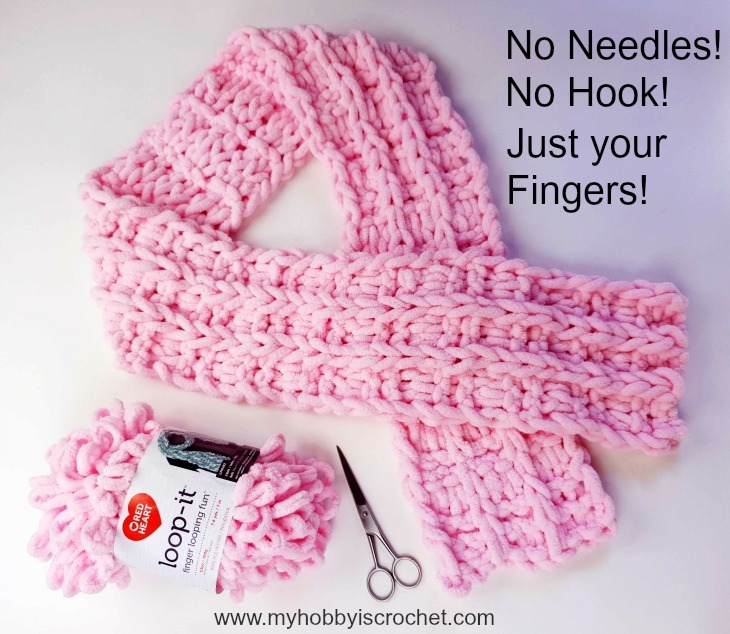 You will only use your fingers and the new Loop It Yarn from Red Heart! 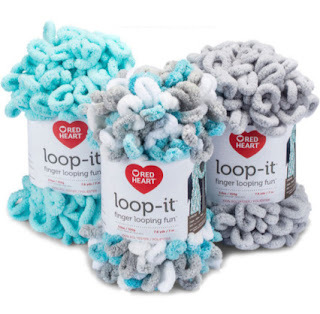 The Loop It - Yarn is a super soft, chenille type of yarn and even if it's Jumbo yarn weight, the items made with it are very light. 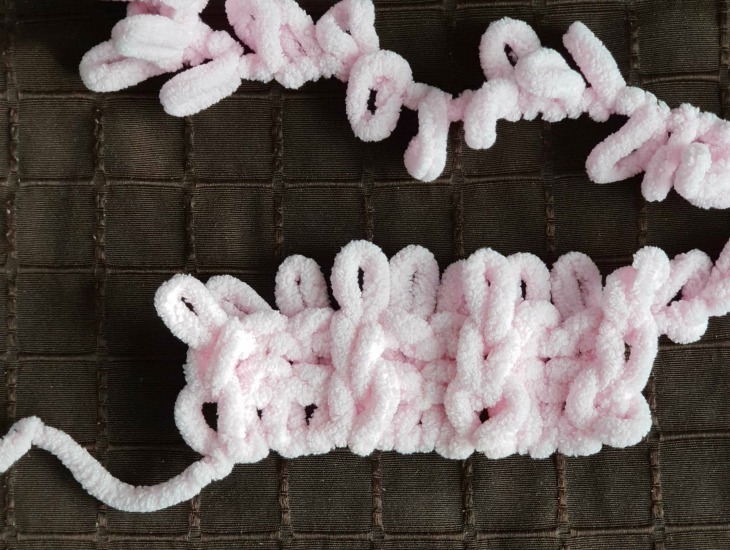 This yarn is made out of loops and you only need to pull the loops through one another to create knit look projects. The basic loop it stitches are just like the ones used for knitting: the loop it knit and the loop it purl. Click on the yarns to buy Loop It Yarn on Red Heart Site! GAUGE: It's made by the yarn loops. Not important here. 163 cm long and 17 cm wide. You can make a shorter/ longer scarf by making less/ more rows as in the pattern indicated. 1) You will never turn your work, you will always work with the right side facing you, alternating working one row from right to left and one row from left to right. 2) In order to have a beautiful edge (as a knit st), after working the first and last st of each row, you will bring the yarn behind the first stitch to make the second st and behind the last st to begin the new row. ( If the 2nd st needs to be a purl st, you will first bring the working yarn behind the first st and then to the front of the second st of previous row). Make the same for the last st to begin the new row. Otherwise, the edge sts will look like knots! 3) The pattern is not hard, only a bit wordy. Before you begin with the pattern, make sure to learn how to make the sts involved watching Marly's Video Tutorials above! 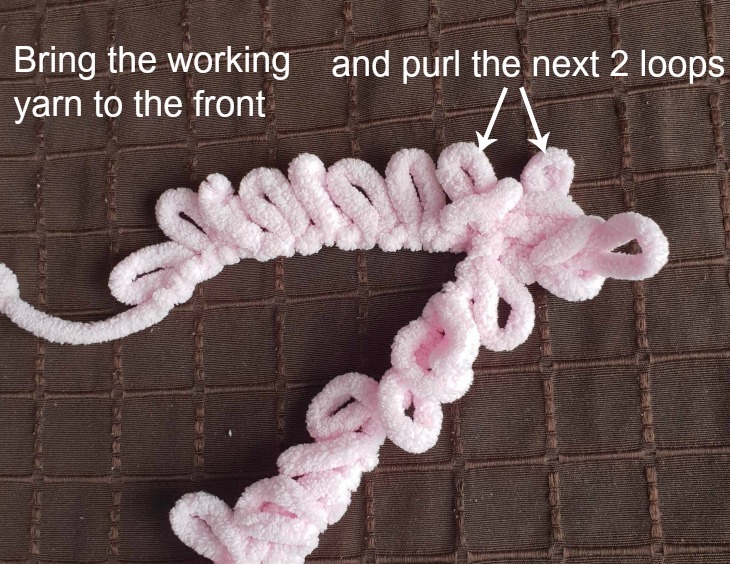 To begin snip the first 2 loops from your yarn end to ensure you have a yarn tail. 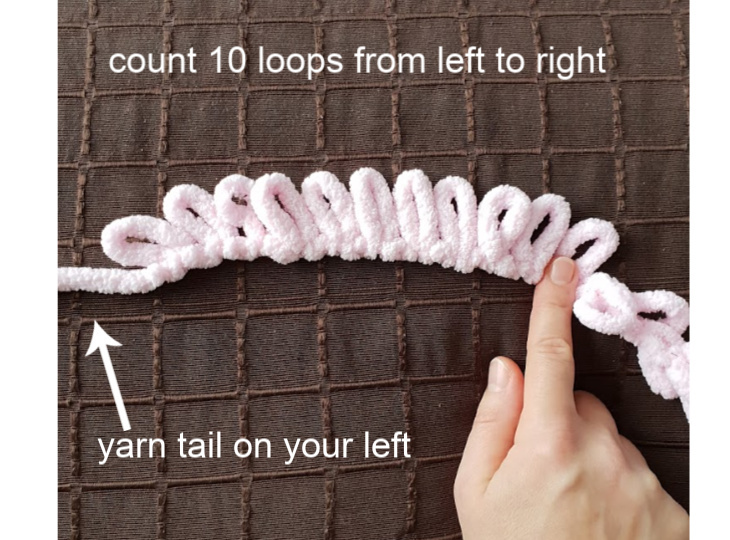 Base row: With the yarn tail on your left, count the first 10 loops and lay them on a flat surface with the loops facing upwards. Step 1: With the working yarn in back, pull the 11th loop (from working yarn) up through 10th loop (last loop of base row) from behind to create a knit st. Step 2: *Bring the working yarn to the front and pull the next loop from working yarn through next loop of foundation row from front to back to create a purl st. Step 3: With the working yarn in front pull the next loop from working yarn through next loop of foundation row from front to back to create a purl st. 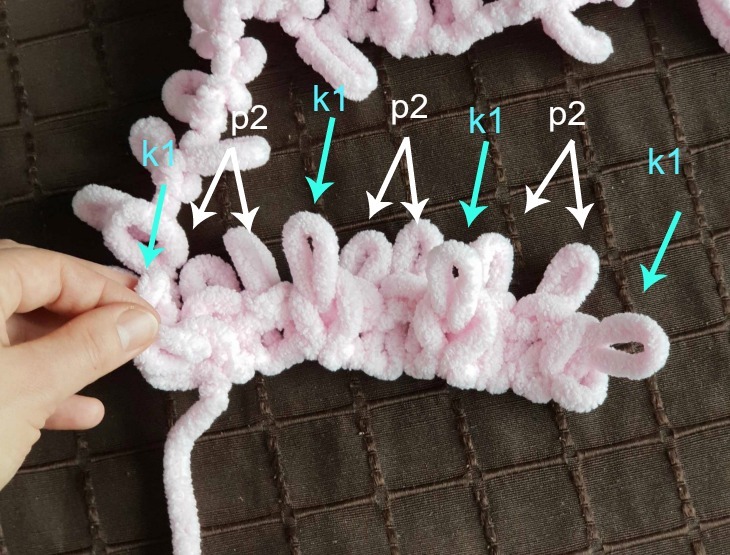 The picture below is showing two purl loops created in steps 2 and 3. 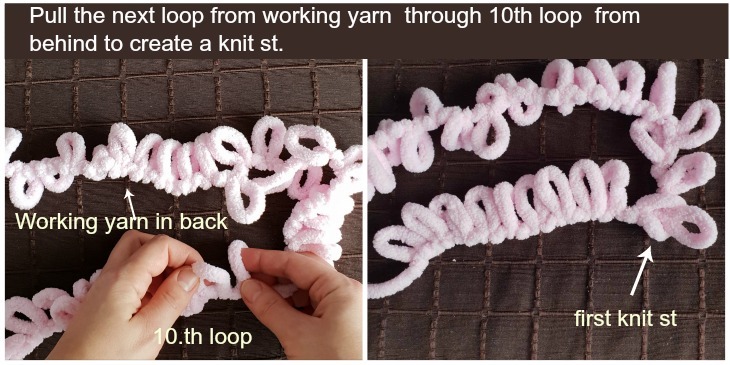 Step 4: Bring the working yarn to back and pull the next loop from working yarn through next loop of foundation row from back to front to create a knit st.
Do not turn your work! Working from left to right, with working yarn in back, pull next loop from working yarn up from behind through last stitch worked on previous row as for a knit st.
*Bring the working yarn to the front and pull the next loop from working yarn through next st from front to back as for purl st.
With the working yarn in front pull the next loop from working yarn through next st from front to back to create a purl st.
Bring the working yarn to back and pull the next loop from working yarn through next st from back to front to create a knit st. Working from right to left and with the working yarn in back, pull next loop from working yarn up from behind through last stitch worked on previous row to create a knit st.
*Pull next loop from working yarn up from behind through next stitch to create a knit st. Repeat from * across to end of row. Make the scarf as long as you like, then cast off after the first combined sts row. The cast off row will be a combined st (knit and purl) cast off row! knit the next st and then pull it through the previous bind off loop; repeat from * till end of row. Snip the next loop on the working yarn to make a tail and pull the yarn tail through the last working loop. See below Marly’s Video how to cast off, but apply the instructions I gave you above! She is showing you a knit cast off row! 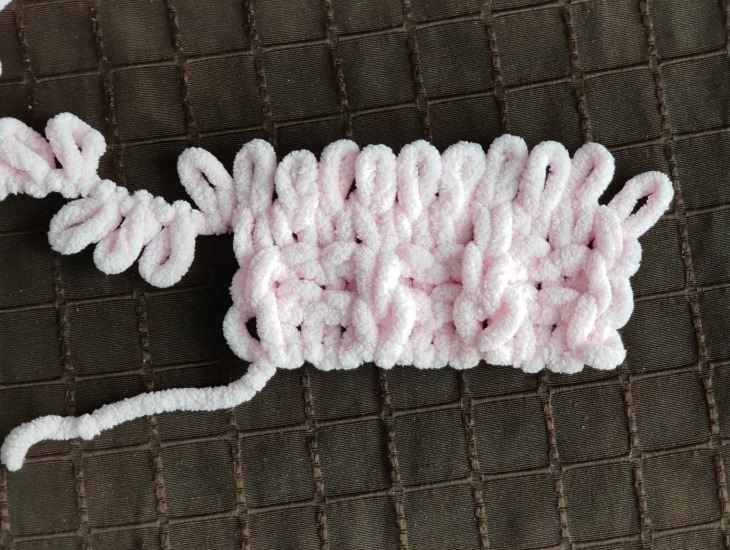 With your fingers or with the help of a crochet hook, weave in all ends. For more free patterns and tutorials, please visit my FREE Pattern Page! Share your projects and get support in our Facebook Group My Hobby is Crochet! This pattern is free for your personal use, you can sell the products of your work, a link back to my blog would be appreciated. Do not use my photos for selling purposes or modify them in any way. Please don't repost the pattern itself to any other sites, but please share the link to the pattern if you want to share the pattern with your friends. You may not give away copies of this pattern.